Our yearly project of ranking each team at each position continues with center fielders, the position of Mays and Mantle, the position at the crossroads of the offensive and defense parts of baseball’s positional spectrum. Let’s get straight down to the business of ranking the players who come after Mike Trout. Nowadays, center field is largely seen as a position made up of Mike Trout and Everybody Else. And with a major identity crisis, that conclusion isn’t so far off. There’s no clash of center field greats, with Trout largely lapping the field. 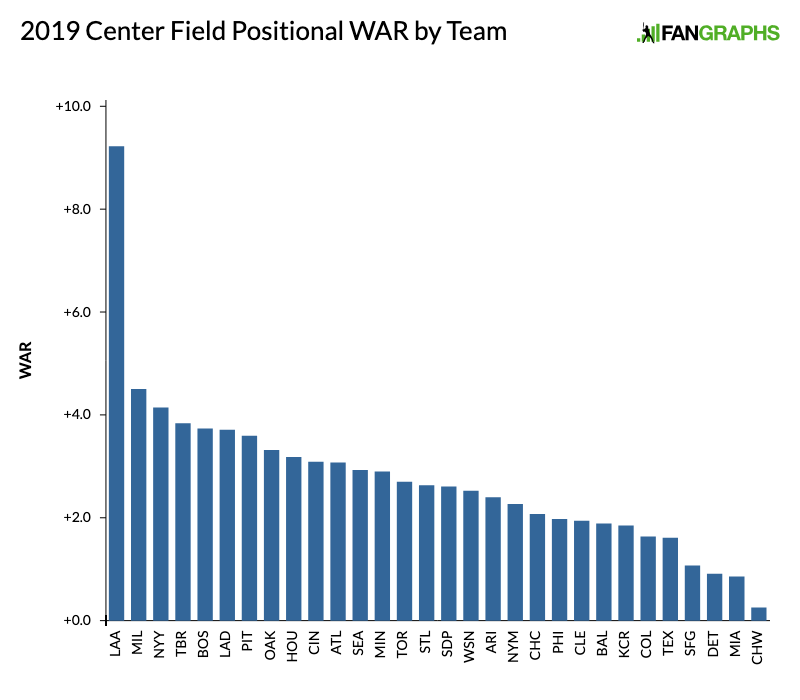 Looking at many of the leaders in WAR at the position over the last five years, a great many won’t play center field in 2019 or have already moved off the position: Andrew McCutchen, Charlie Blackmon, Adam Jones, Marcell Ozuna, Christian Yelich, and so on. After Trout and Lorenzo Cain, who jumps out as an all-around star at the position, the way a Carlos Beltran or Jim Edmonds did? Nor, with baseball’s traditional roles changing, can center field claim to be the most popular home for leadoff hitters. In 2018, leadoff hitters played centerfield only 24% of the time, the lowest figure in the Split Leaderboards (which go back to 2002) and well off the 41% mark for 2013, just six years ago. Center fielders hit .253/.319/.407 in 2018, the position’s second-worst OPS since 2002, and amassed -3.4 wRAA, also their second-worst. Where the highs of center field aren’t very high after Mike Trout, the position does still have impressive depth, with few teams having truly desperate situations there. Looking at the ranks, if I’m running a contender, I wouldn’t be terribly upset about my center field situation until I’m down around No. 21 or so. It’s a position defined by workaday adequacy; unless Ronald Acuña reclaims center, by rest-of-career WAR in ZiPS, Trout is the only one in the top 50, with the next 50 only adding Victor Robles and Ramon Laureano. Someday, a new crop of center fielders will challenge an aging Trout in the twilight of his career, but they may be in middle school right now. We hoped you liked reading 2019 Positional Power Rankings: Center Field by Dan Szymborski! So the Indians were 3 spots behind the O´s in left field, and are 1 spot ahead of them in center. As an Indians fan, all I can say is….thank God we play in the AL Central!!! In some circles they’ve started pools betting on when Mercado gets the call. That would still leave a couple holes in the OF. Indians are pretty crafty at the trade deadline and position players are relatively cheap. They won’t go to the playoffs with this outfield. In 2003, the Yankees made the World Series. Their three primary outfielders were worth a combined 2.6 WAR, with 2.4 of that coming from right fielder Raul Mondesi. Hideki Matsui put up 0.2 WAR in 695 plate appearances, on the back of one of the worst defensive seasons of all time; center fielder Bernie Williams was worth 0.0 WAR in 521 plate appearances, on the back of the one of the other of the worst defensive seasons of all time. The next year, the Yankees picked up Gary Sheffield. He was a great hitter. That year, Fangraphs shows the Yankess’ primary outfielders (Matsui, Williams, and Sheffield) being worth -28.8, -29.2, and -21.1 runs, respectively. Matsui and Sheffield, at least, had good enough offensive years to overcome that defense. That’s the Yankees team that infamously lost to the Red Sox in the ALCS after blowing a 3 games to none lead. In 2005, the Yankees decided to keep the band together, and Matsui, Williams, and Sheffield put up -22.0, -30.2, and -34.1 runs defensively. They ended up losing to the eventual champion White Sox in the ALDS that year. Those three were also worth a combined 2.6 WAR, with Williams’ total of -2.3 cancelling out the combined 4.9 put up by Sheffield and Matsui. Incidentally, Fangraphs shows the Yankees as a whole being worth -160.9 defensive runs that season, with Robinson Cano, Jason Giambi, and Tony Womack all being between 15 and 20 runs below average, and Tino Martinez, Derek Jeter, Ruben Sierra, and Matt Lawton all also being pretty terrible. Great stuff! Though to be fair, the Yankees at least had outfielders with a track record of success. The Indians don’t have that. And Baseball Reference has that 2003 Yankees team with 6.3 outfield WAR. Which was still more than the team they lost to in the World Series, as the Marlins only had 4,6 BR WAR. BR gives that 2004 Yankees outfield 10.0 WAR. And then the 2005 team plumetted to 3.6. So maybe it’s not that unusual to have a playoff team composed of outfielders who don’t contrbute much. What I think is unique is that a team that everyone projects to win their division only has a single OFer on their 40 man roster with more than 2.1 career WAR – Martin with 11.6. Or just think of your left side of the infield and starting rotation, and then look at the O’s.